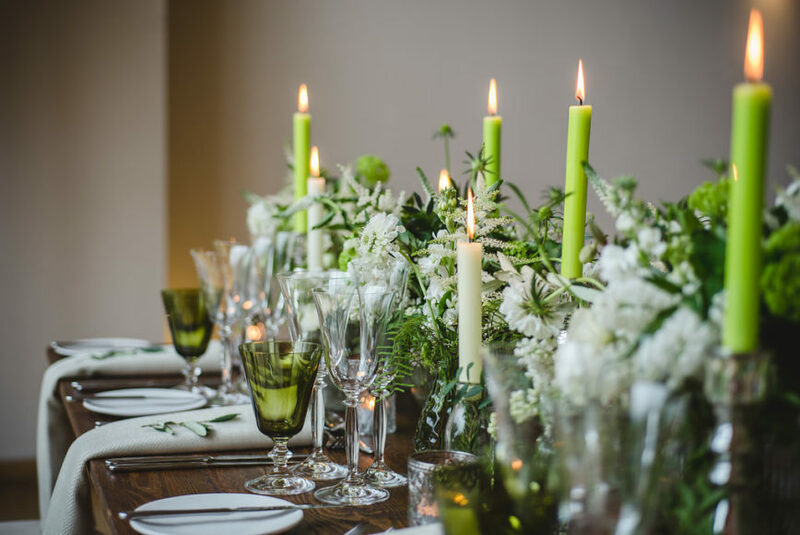 This week, we are sharing with you all Mr & Mrs Pursey’s Spring Wedding Day; a day that involved a team of fabulous industry professionals & so many really stunning & carefully thought through styling details. With the Spring weather on their side, S&A were lucky enough to have the very first Arbor Wedding Ceremony of 2017 & in charge of making the Arbor Garden look extra beautiful on the day was The Flower Pocket, who created gorgeous blush & white floral pew ends which lined the Arbor aisle. 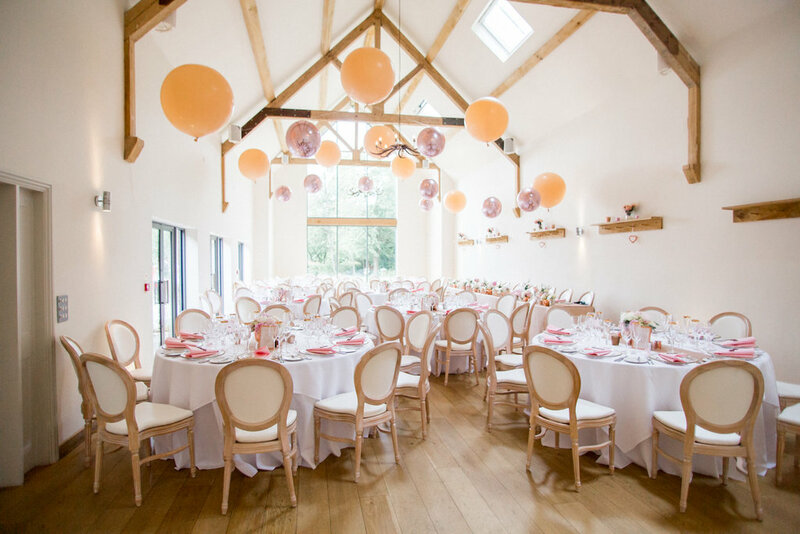 The inside looked equally as breathtaking with S&A choosing to have two banquet tables running down the length of the Dining Barn, a setup that really accentuates the length of the Barn & the floor to ceiling glass wall. The tables were then adorned with light grey linens which complimented the soft floral colour palette perfectly & The Flower Pockets continual foliage arrangement that ran down the centre of each of the tables looked utterly stunning. Adding further to the gorgeousness of the day was Mr & Mrs Pursey’s elegant Wedding Cake created by MBC Partner Ellie from Milk Street Kitchen, complete with white buttercream & gold leaf (no less). Their chosen Photographer was the wonderful VLA Photography who always takes so much care in capturing the all important details of the day & never fails to take such brilliant shots of the happy couple around the Millbridge Court grounds. It is always such a pleasure to have VLA joining us & thank you to Jon for allowing us to share his wonderful imagery on our blog. With Autumn well & truly upon us, it seemed like the perfect time to share with you all one of last years stunning October Wedding Days. C&I’s vision for their day was simply breathtaking & the suppliers that brought their autumnal vision to life did so perfectly. 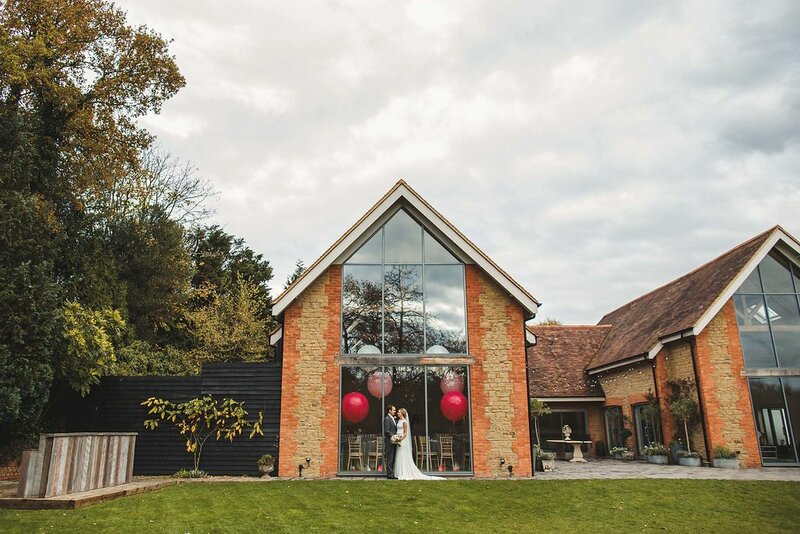 Their florist was none other than the wonderful Jay Archer Floral Design who created the most phenomenal Ceremony Archway, not to mention the stunning floral arrangements in both the Ceremony & the Dining Barn, abundant with rich, colourful flowers & foliage. Little touches such as dried leaves lining the aisle & hanging fresh leaves from the pegs & shelves really added to the theme & made such a spectacular visual impact. In charge of capturing the beautiful details & styling touches, as well as all of those special moments was Guy Collier, a photographer who always manages to tell the story of the day so seamlessly, from the Bridal preparations, right up until the dancing is well underway. Whittling the images down to choose which ones would be featured below was near to impossible, so this may just be one of our longest blog posts to date, but there were just far too many exquisite details, happy moments & beautiful couples shots to choose from.